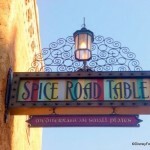 Photos and Review Part 1: The NEW Spice Road Table in Walt Disney World’s Epcot! Hooray! We’re finally celebrating our first taste of Spice Road Table! 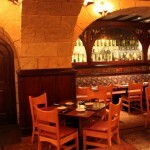 We’ve been eating our little hearts out at Epcot’s newest tapas restaurant and we can’t wait to tell you all about it! Our review will be broken into a few parts, since there’s SO much to share! 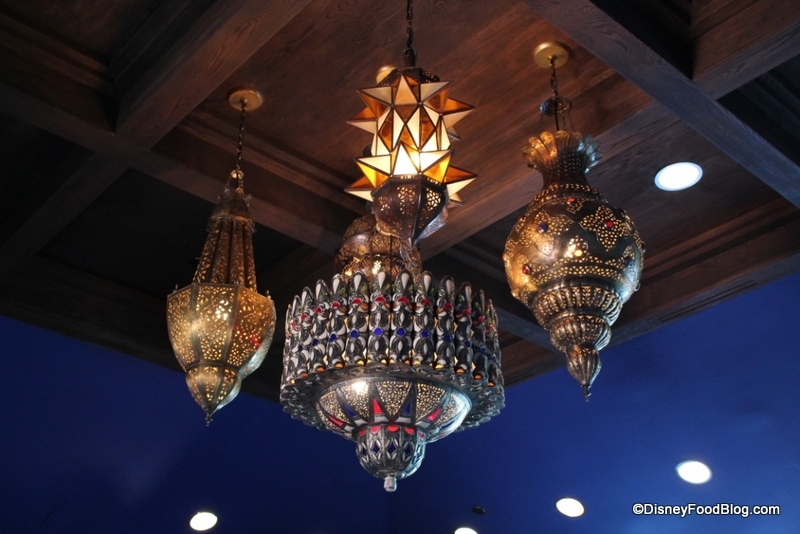 Spice Road Table will be soft opening on Saturday for the public (a grand opening has not yet been scheduled), and we want to hear what you think! The tapas-only restaurant features small plates (which means you can order a LOT!) 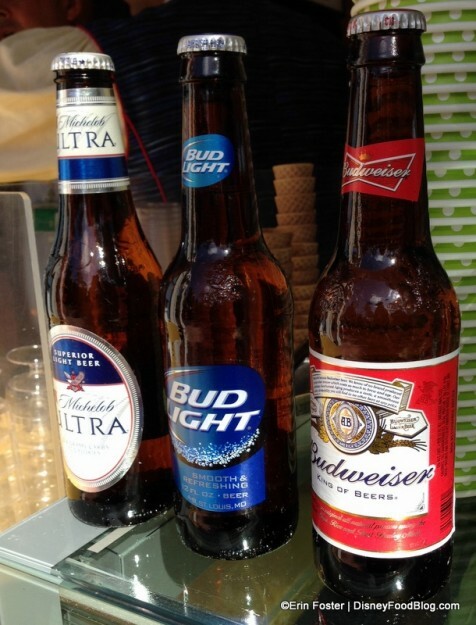 as well as specialty drinks, a full bar, wines, beers, and more. There’s even some chef-crafted ice cream (we got to try all five flavors!!) — scroll down to see our review and some fun pics! Here you’ll see pictures of the new Juice Bar, the outdoor seating at the restaurant, and even the indoor decor! It’s gorgeous!! We can’t wait for you to check it out! Spice Road Table, Epcot’s newest restaurant taking up residence on the shores of World Showcase Lagoon in the Morocco Pavilion, will surely be a destination for many Disney food lovers like me! The space combines 60 indoor seats and 120 outdoor seats, so guests will be comfortable no matter the weather. Now, let’s take a peek INSIDE the restaurant! As you can see, the space inside is small, but well appointed. 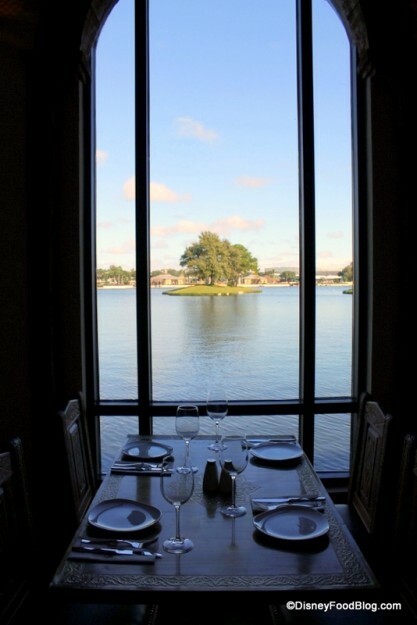 There is a view of the water from every single table through the giant wall of windows looking onto World Showcase Lagoon. Yep — this will absolutely be a hot ticket for the fireworks! 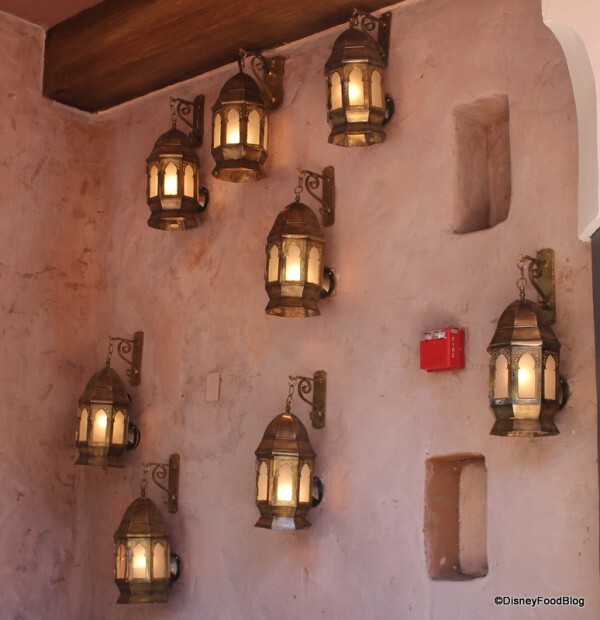 Decor elements include bright colors, plenty of Moroccan additions, and some truly gorgeous lamps and lanterns. But, of course, the main draw is the view!! I’m looking forward to sitting at this table soon! 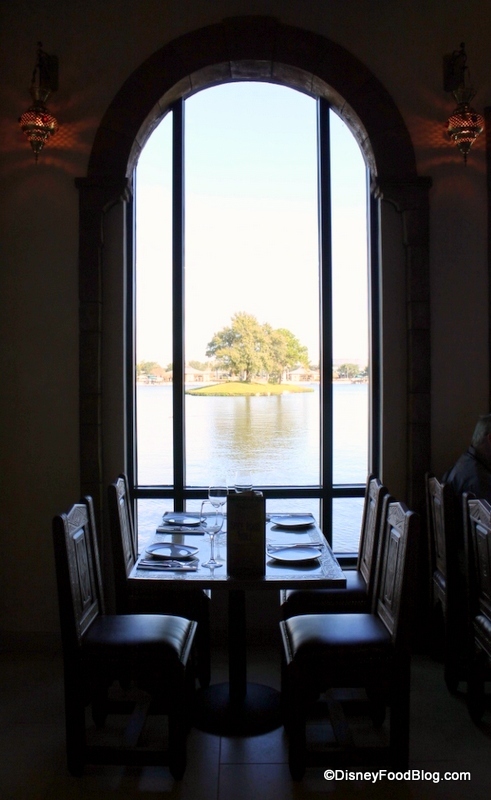 The atmosphere was meant to give the feel of being in Mediterranean waters, so the focus both outdoors and indoors is on the water surrounding the restaurant. 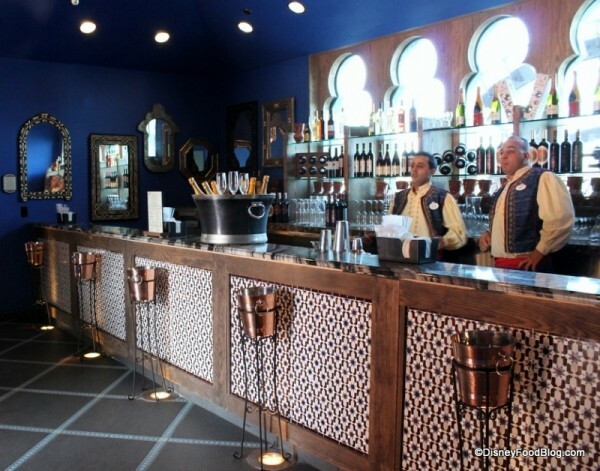 The full bar features some great specialty drinks…and, of course, custom design! 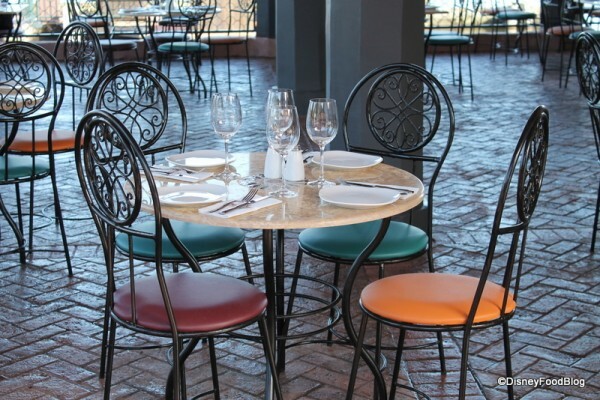 But if outdoors is your choice (which it might just be on a gorgeous day like today), here are a few fun views of the outdoor terrace seating area! All tables, chairs, light fixtures, and other decor for the restaurant were custom made in Morocco and shipped to Florida for the construction! These fun lanterns will make a gorgeous glow in the evening before the fireworks. And even the overhead lighting is custom made and stunning! 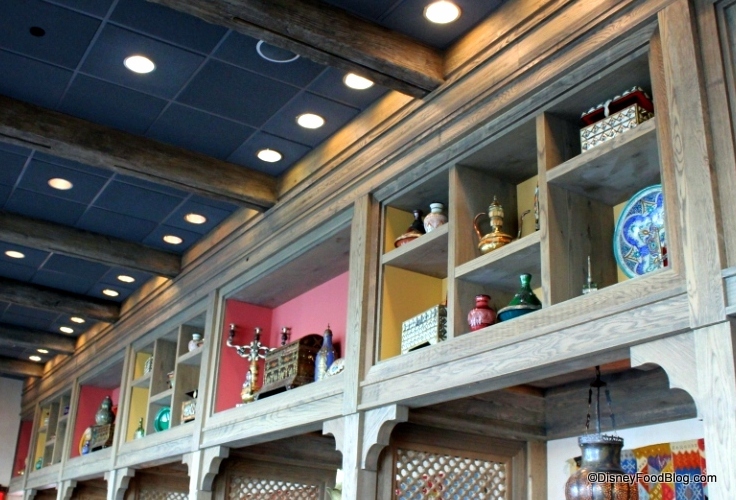 Once you head back outside, you’ll see that Spice Road isn’t just a restaurant. There’s a whole retail section as well, and even a built-in juice bar! 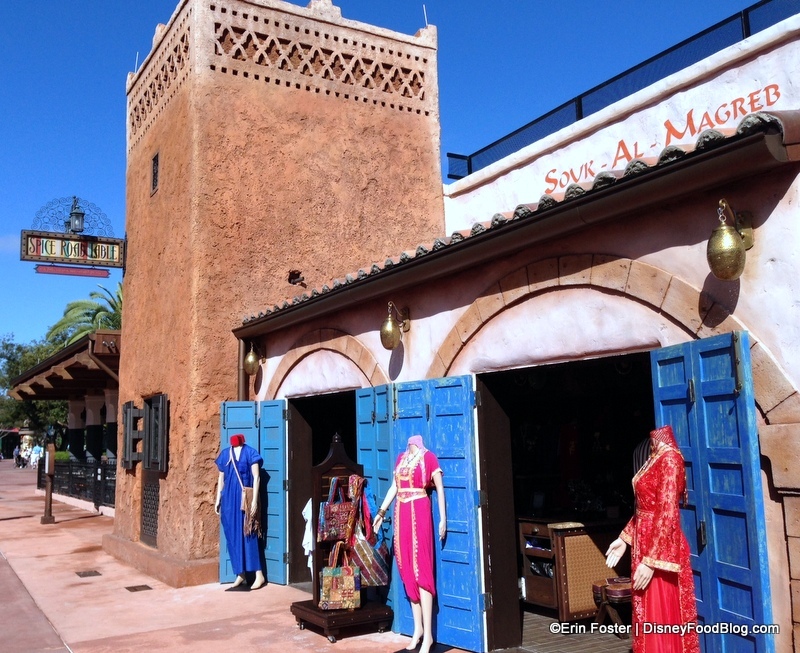 Disney fans will remember the shops in the Morocco pavilion near the water — these are essentially back in a new way. And, yep — you can still get your Henna tattoos. 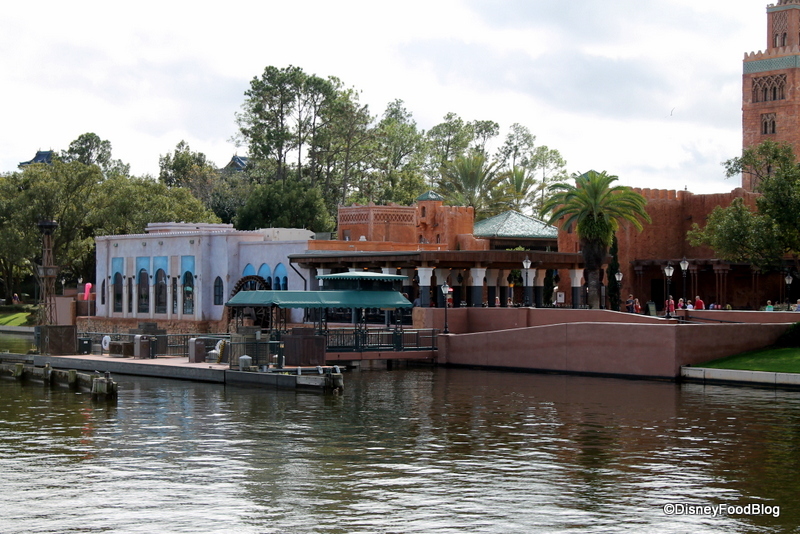 The juice bar replaces the old snack kiosk which used to stand opposite the Lagoon in the Morocco pavilion. The small plates variety at Spice Road Table means you get to try a lot of the offerings all at once! 🙂 Stay tuned to DFB this weekend for more deliciousness from inside the restaurant, but you can take a peek at the Small Plates menu and start choosing now which goodies you’ll be trying on your first visit… . But while we wait for that review, let’s sample some of the goodies from the juice bar outside! This is more than just juice, mind you — you’ll be able to indulge in chef-made ice cream, pastries, drinks, and more! First up: that new chef-crafted ice cream! We got to sample five different flavors today: Toasted Almond and Rosewater, Chocolate and Cinnamon, Green Tea, Pistachio and Orange Blossom Water, Strawberry and Red Bean. And we were the first people EVER to try it!!! Yay us! 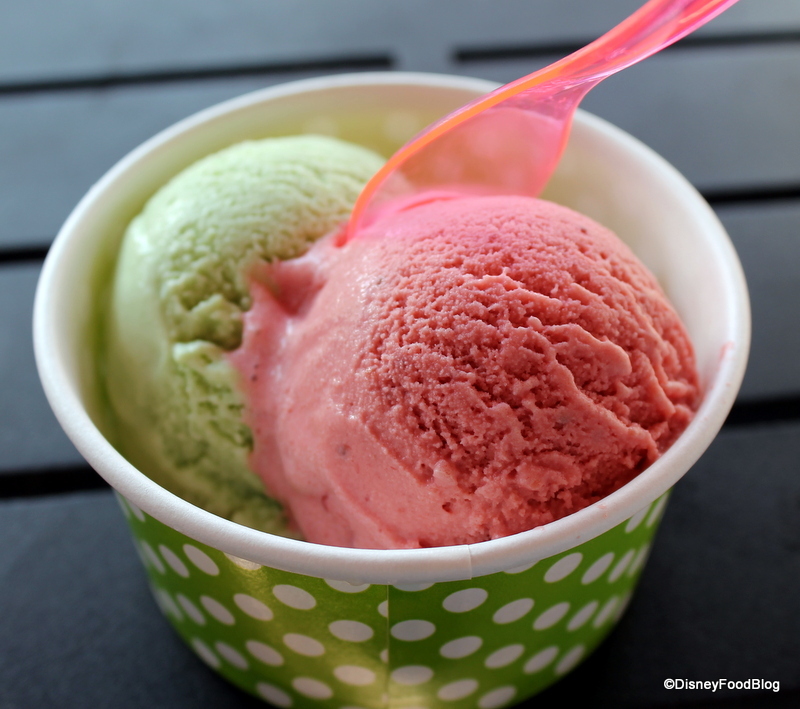 The ice cream is served in a cone or a cup, and you get two scoops for $4.99. This first batch is a combo of Chocolate and Cinnamon (on the left), and Almond with Rosewater (on the right). SO fancy, right?? 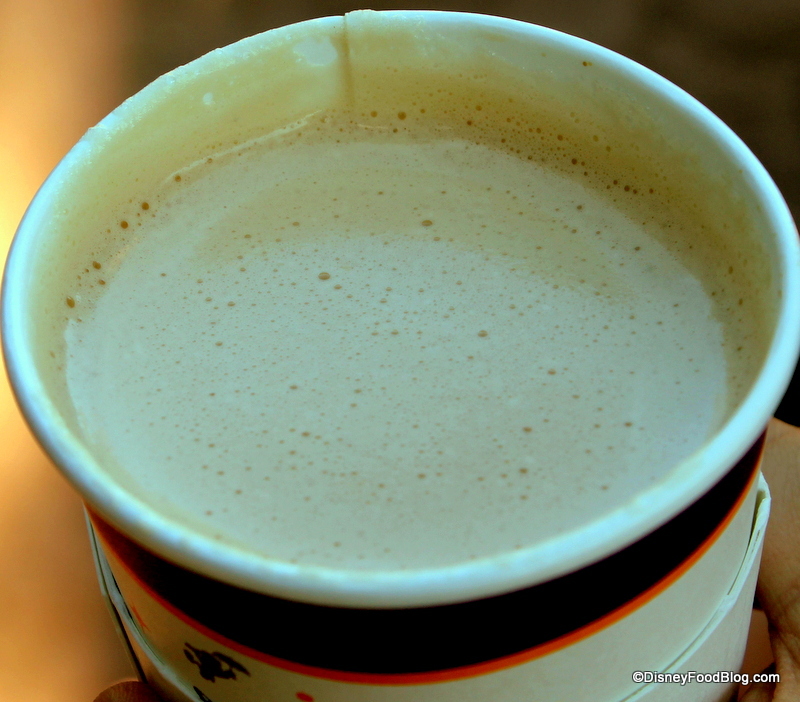 We loved the chocolate and cinnamon flavor. The cinnamon was not overwhelming, but was still enough to make it distinct and a little (teeny!) bit spicy. Another couple of flavors to share! Red is Strawberry and Red Bean, Green is Pistachio and Orange Blossom Water. Delish. 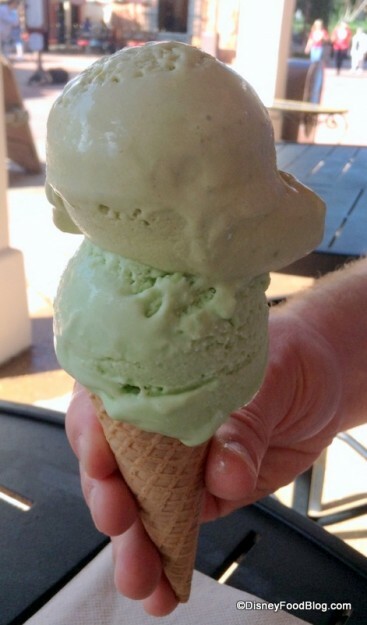 And here is the Green Tea and Pistachio…in a cone! 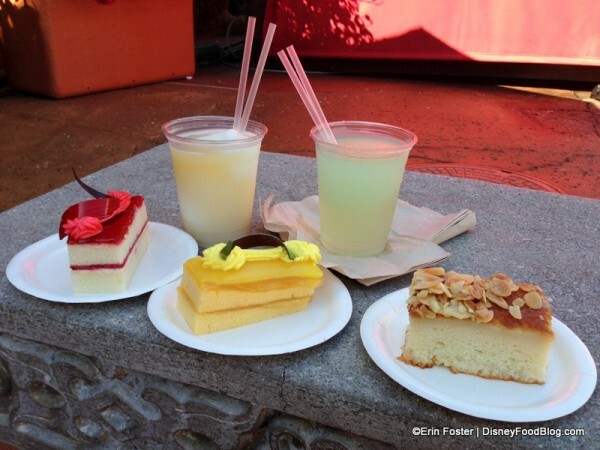 Now, on to the pastries and drinks! These are absolutely beautiful — and Erin got to try them all! First on the list: this stunning little Orange Cake. A simple name, but some yummy complex flavors! 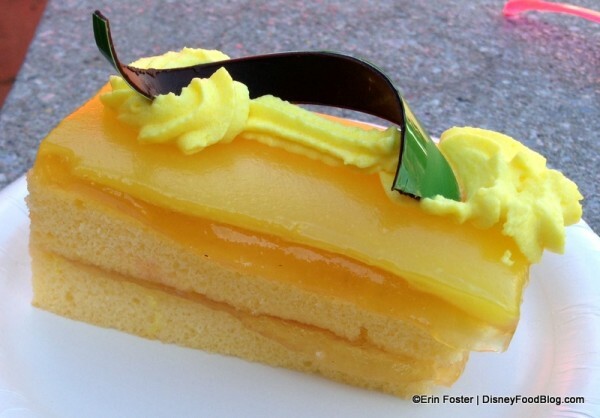 This one is dense, with an orange curd filling (YUM!!!). The Raspberry Cake was light and refreshing with an airy texture and a “jammy” top! The raspberry flavor was very fresh and real — not fake like you’d find in a slushie. 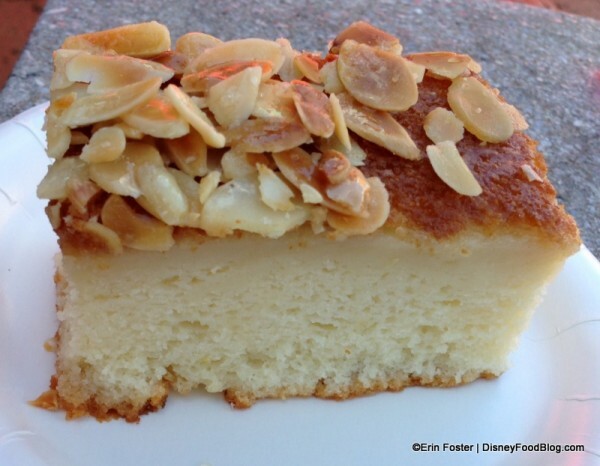 And this classic Almond Cake was up next. It was dense and very moist — almost like a dry cheesecake! It had a floral almond flavor that took Erin a while to get used to, but she eventually ended up really liking it! 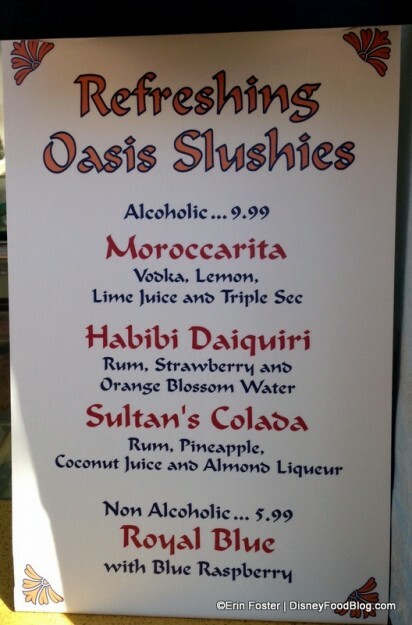 Of course, she had make sure the Oasis Slushies were still worth ordering for ya! 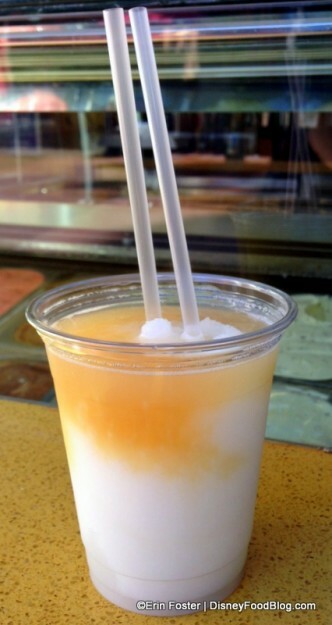 The Sultan’s Colada was “SO Good. SO Strong!” according to Erin. 🙂 The rum and juice and ice were almost in layers, so each hits you at a different time. 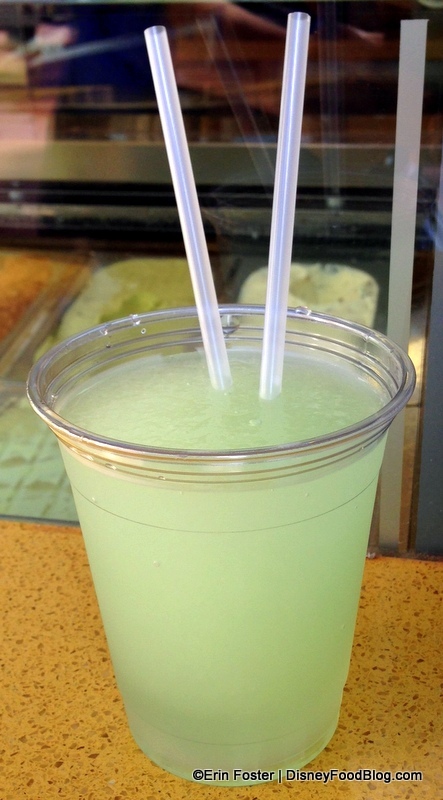 And our old favorite, the Moroccorita, continues to have a nice, limey margarita flavor — fruity, but not too icy or cold. 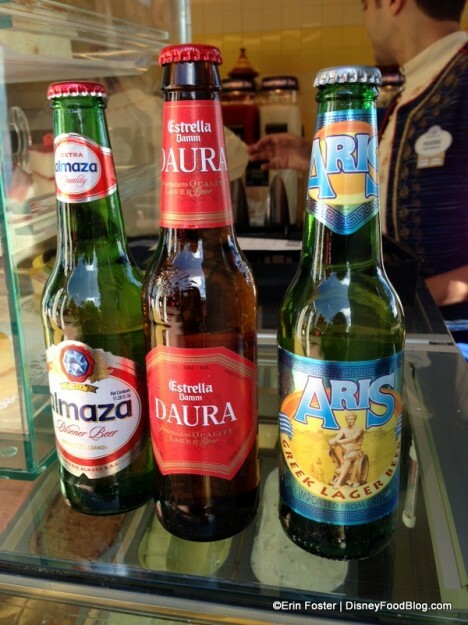 …and domestic ones, by the bottle. …and, of course, soft drinks! Spice Road Table, soft opening on Saturday for the public (the grand opening is not yet scheduled) will absolutely be a must-do restaurant for guests looking to expand their palates with authentic Moroccan cuisine in a gorgeous, waterside atmosphere. 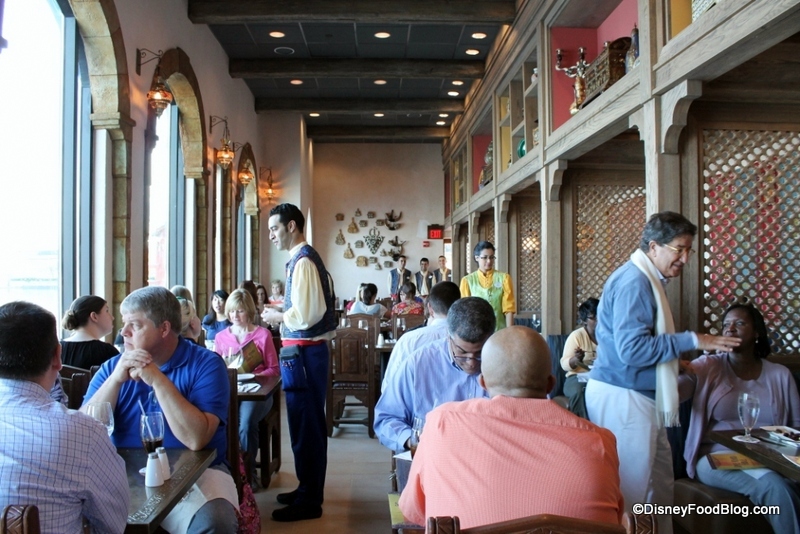 Remember, there are no Advance Dining Reservations for Spice Road, since it’s a walk-up only, small plates location (like Tutto Gusto in Italy). And you won’t be able to use your Disney Dining Plan here. The jury is still out on whether or not Tables in Wonderland will be accepted (we’re hoping so!). We’ll be back veeeeery soon with a full review of the menu inside! 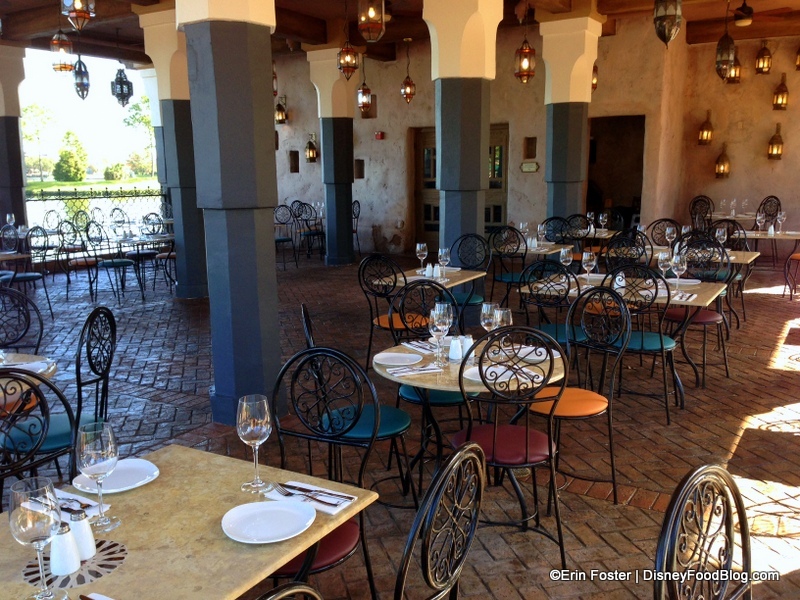 I can’t wait to share even more about this stunning new destination restaurant in Epcot! 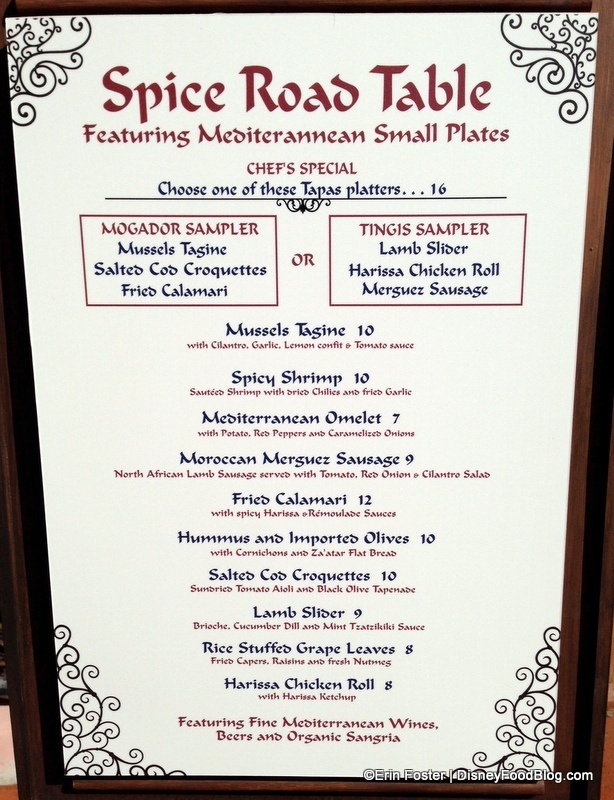 Are you excited about trying Spice Road Table? Let us know in the comments below! Very much looking forward to trying SRT! It looks beautiful, and the no ADR-policy is a real plus in my book. It keeps the spontaneity in a day at Disney. However, I am disappointed that the juice bar does not serve actual fresh-squeezed/juiced juices. I was excited thinking Disney was getting in on this healthy craze, and I think such a juice bar would fit in nicely with the Moroccan theming. I am hoping they will add freshly-made juice to the menu eventually. Thanks, Erin for trying all those goodies for us!! They look delicious! Looks awesome and I definitely want to try it, but… I agree with Anna. Shouldn’t a juice bar feature, y’know… juice? Can’t wait to try this! 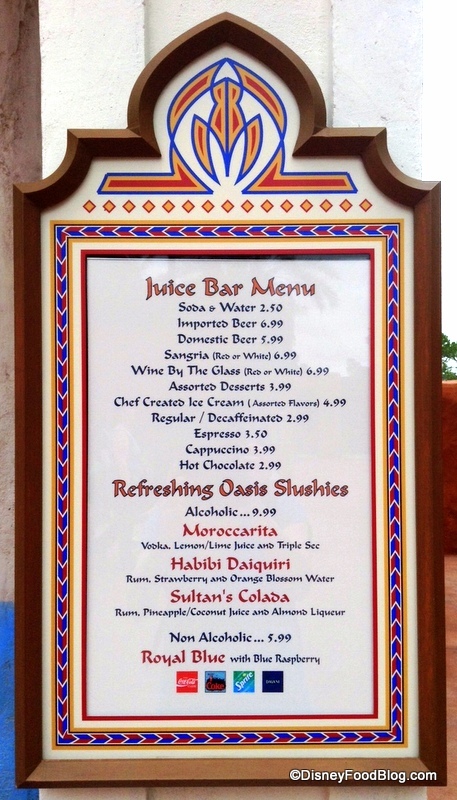 I’m also bummed the “juice” bar doesn’t really have any juices. And where’s the Moroccan mint tea?! Guess I’ll still have to trek back to the back counter of the counter service place to get that. Bummer. I have a couple questions. Can you get the drinks as virgins, and if so does the price drop? 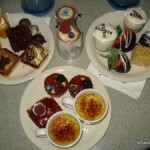 Can you use snack or any sort of dining plan for any of the items on the menu. Thanks. Can’t wait to try it all!!!!! So disappointing that they would take the time to call something a juice bar and not even sell orange or apple juice. I just don’t get the dearth of truly health options at WDW in general. That being said, I was not looking to get a green drink at SRT, so that’s OK. Perhaps some more realistic traditional beverages to go with what looks like an excellent menu would be even better. After eating at Sanaa and Jiko and being SUPER impressed, I am looking forward to the flavors that this new spot promises. Why can’t you use DDP? looks yummy! My only question is any thing on the menu gluten free? I agree about the juice! So bummed they don’t have any! 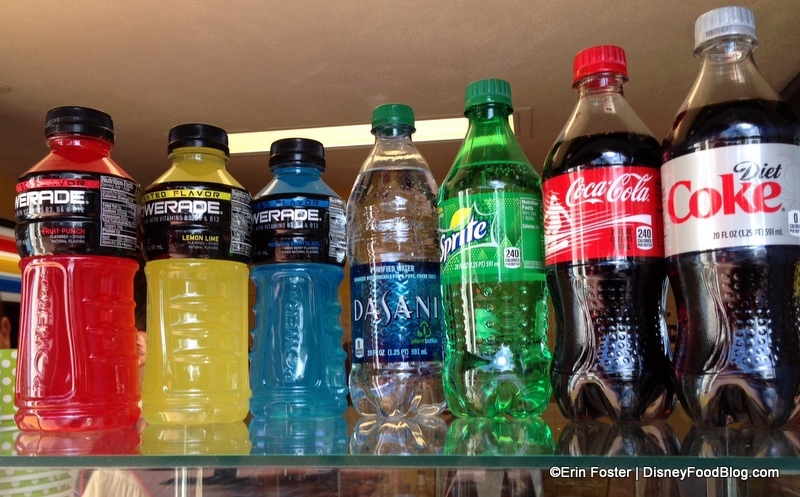 Why doesn’t any restaurant offer Sprite Zero? I don’t want caffeine and sometimes water just won’t do it. I have diabetes so regular soda and most other drinks are out. Looks promising ! Hope to see a wine list, but I like some of the small plates. I cannot wait to go here in May! It looks gorgeous. Hope the food is just as spectacular! We cant wait been hoping this would open in time for our first trip to the Flower and Garden Show . But I do agree Juice would be nice , right now the green tea at China is our go to cold non alcholic choice. 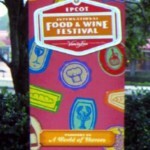 Does any one have feed back from last years Festival now that they have food and wine TOO. Oh my! 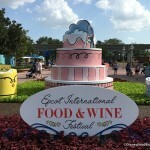 The ice cream and desserts look so amazing, I’m so excited about these! Must have some next time we visit! The restaurant itself looks gorgeous. Thanks so much for the review!! Reading this blog is one of my favorite things about planning my trip! 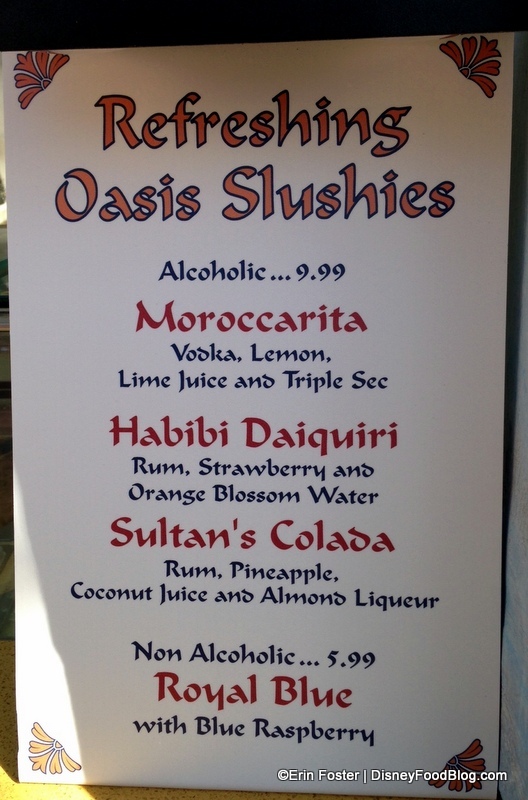 I can’t wait to try Sultan’s Colada! My husband and I are celebrating our 27th wedding anniversary in Disney starting on Tuesday 1-14-14. I have been calling every week for a reservation in the hopes of dining here. 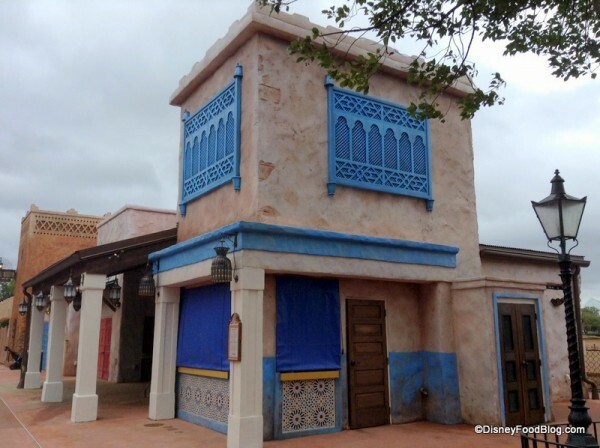 From what I understand they still are not taking reservations, but I am so excited at the possibility of eating here next week during our trip. It looks amazing! This place looks like a MUST for whenever my next visit is. I am a huge fan of Mediterranean/ Middle Eastern food, and the menu has me drooling. (Especially that triple-seafood chef special!) 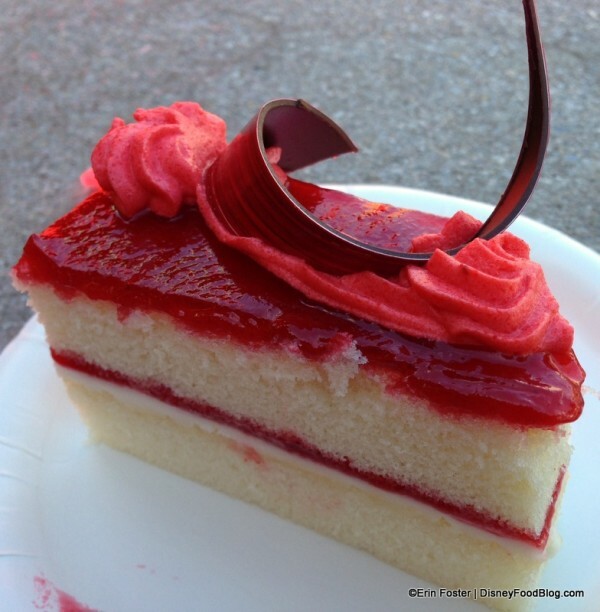 That raspberry cake looks amazing, too! I got excited at the thought of an honest-to-goodness juice bar being here. Although it seems more fitting for The Land. Disney, can you hear me?! I’m glad to see a place with delicious food that does not take ADRs since I often wander and sample my way through the parks. After Beaches & Cream went ADR I was wondering if that would start a trend. I echo the sentiment regarding the lack of juice. The area I live in has numerous Lebanese and other Arab restaurants and even the smallest carry out joint has an industrial juicer up front. Disney is really missing the mark there. 1) I imagine since it’s called a Juice Bar it will eventually serve juice. Note that this is a soft opening and the menus are likely not finalized. 2) Reminder that this location does not take reservations, so you will not find it in Disney Dining and the reservations agents will not be able to book it for you. I’d like to try this some day. Can’t wait to try it. 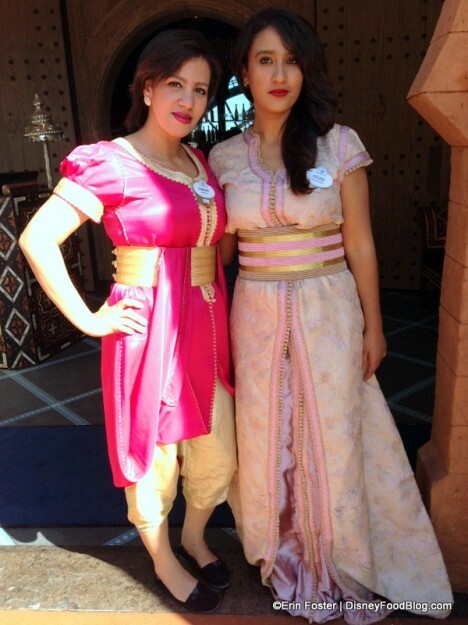 Always enjoyed the food at Morocco. I’d like to see the juice bar serve juices as well but with Soda water in the mix. If they have a soda gun that shouldn’t be a problem. We have a soda stream and our favorite and most refreshing thing is making ‘fizzy’ juice with whatever we have on hand–with no added sugar. Pomegranate, Mango and Hibiscus could fit in the theme with soda water addition. Along with lemonade and basic citrus juices. They could also upsell the drinks with a shot of rum or vodka. (g). 170 until we go back! I can’t wait to try something off their menu! 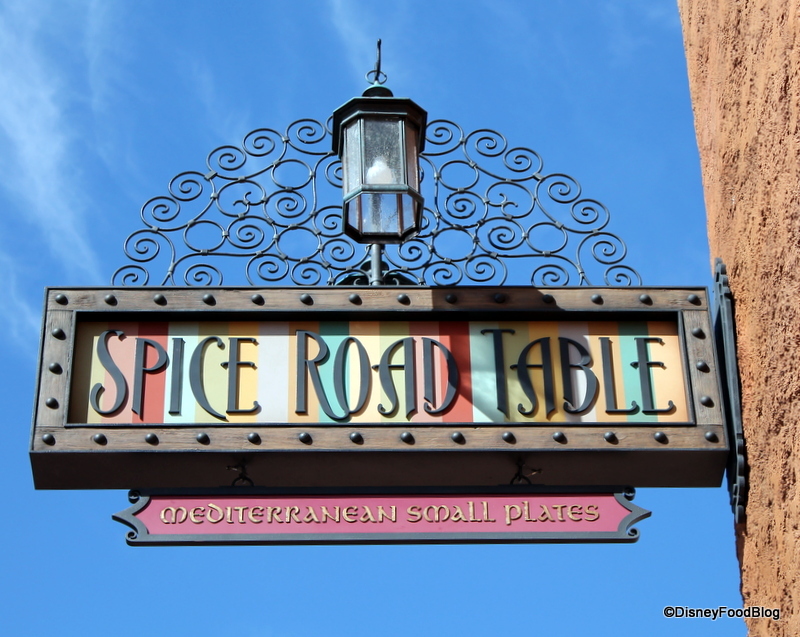 I knew I had seen that color background used in the “Spice Road” Sign before. It’s the same color background of the new California Grill logo at the check in desk. Just stopped by today and at 2PM the place was pretty empty. Outside seating by the water was quite amazing in today’s weather, but the inside seating seemed nice as well with all the tables and booths facing the large windows. This place is going to be a huge hit for IllumiNations. We spent some time just relaxing outside and slowly working our way through some of the menu (and enjoying sangria and Andalusian Nights cocktails). The Tingis Sampler was pretty tasty all around; I can never get enough of the Harissa Chicken Roll. The Mediterranean Omelet is huge, it will fill you up! As someone who isn’t big on seafood, I enjoyed the Salted Cod Croquettes as well. 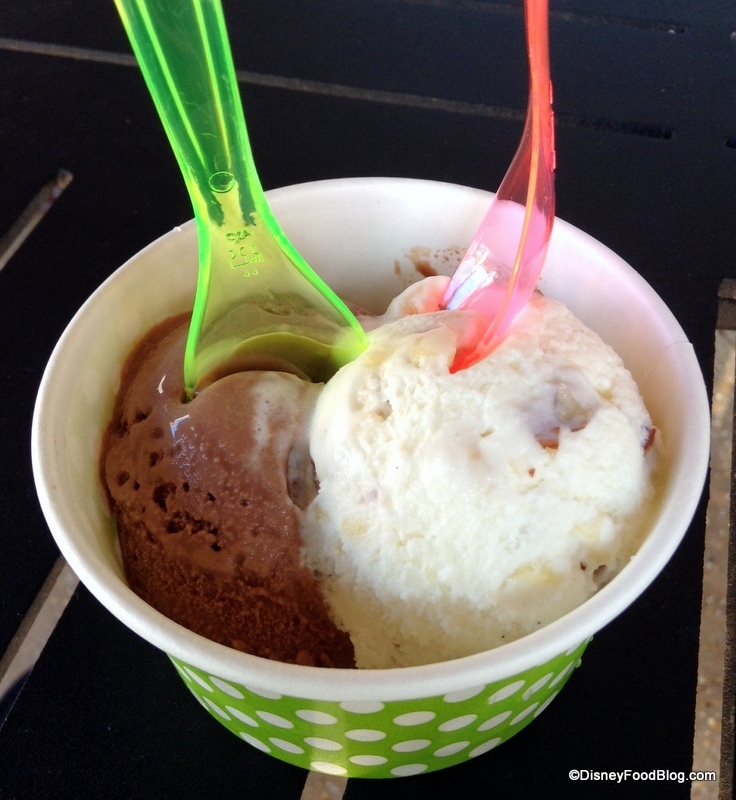 We skipped desserts at Spice Road and opted for the Chocolate Cinnamon ice cream… loved it! Can’t wait to see how they change up ice cream the flavors over time. There are certainly some unique options available currently. 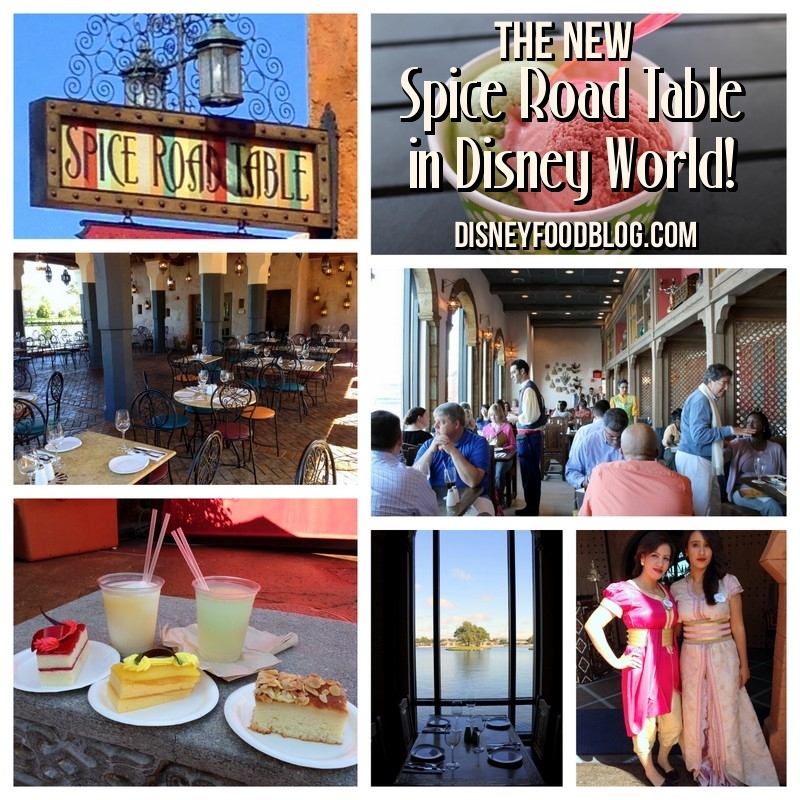 Overall, I quite like Spice Road after a first visit. 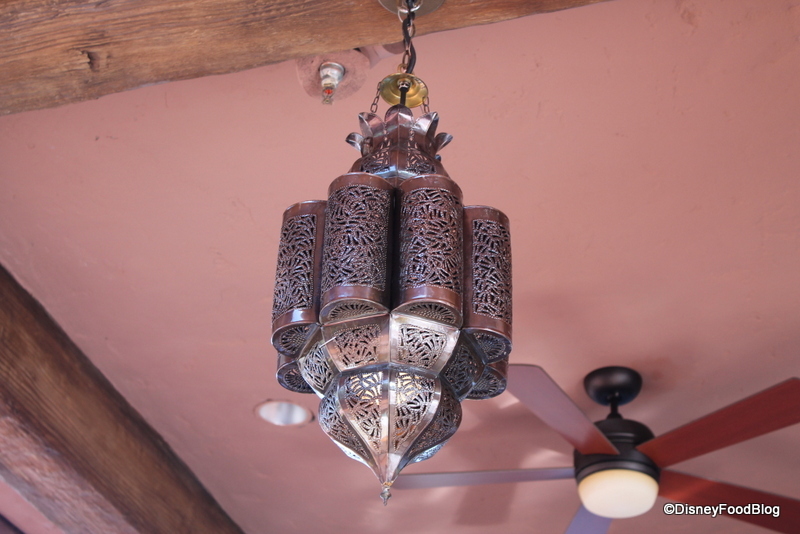 The lack of ADRs is nice for the casual guest, the atmosphere is very relaxing, and the food is good. I do think they need to expand the size of the menu as a small plates restaurant, but I’m sure that will change over time. Oh and no Tables in Wonderland, AP, or cast discounts in place yet. Waiter seemed to think Tables in Wonderland would be coming, but not sure when. We stopped by this afternoon for a late lunch/early dinner. The late afternoon sun was a bit of a glare problem in the outdoor seating area, but we sat outside anyway. Too nice a day not to. I had the white wine sangria, which was very good and not too sweet like I usually find sangria to be. My wife tried one of their mocktails: the Watermelon Delight: made with Watermelon, cranberry juice and orange water. It was also not too sweet and she really liked it. We split three dishes for our meal. First, the Tingis Sampler with the lamb slider, harissa chicken roll, and merguez sausage. We both liked the sausage the best but enjoyed all of it. Second, my wife ordered the Spicy Garlic Shrimp. It came in a shallow dish with shrimp and croutons in a spicy sauce. She really liked it, I am no shrimp fan but ate a piece anyway. It was good for shrimp. Third I ordered the Hummus and Imported Olives. It also came in a long three-dish platter like the sampler. There was a plain hummus and I think a red-pepper hummus. The third tray was a generous portion of pitted olives. Very good. For dessert we asked our server what he liked, and he suggested the Almond and Rosewater Cake, which is what we ordered. We got a large block of what was very much like an almond pound cake. It was dense and a little dry. It was served with a not-too-sweet syrup flavored with rosewater. Together the cake and syrup were excellent. Overall, we loved it. We will probably make this a regular stop for us, and we may yet go back again before we finish this trip next week. Sam Winston — Indeed!! Must be trendy! I love the themeing here. The mulititude of lamps and the beautiful scrollwork on those chairs makes me what to have a morraccan themed room in my house!! Can’t wait for reviews of the food!!!! We visited this restaurant after running the Disney Half-marathon. It was a chilly evening and we were seated outside. They have heaters but half of them were not working. When we asked the manager to move the operating heaters closer to our table he just said “No”. We were seated at 8:30 pm so there were few others in the restaurant. There were avaiable table inside but never offered to move us. Very rude. Should probably not be in the business of “managing”. The food was tasty but small portions. The servers were attentive. If only the manager was human.